Outdoor exercise can boost your mood, energy and wellbeing – and the benefits don't stop there. Sports scientist Luke Ashcroft explains. 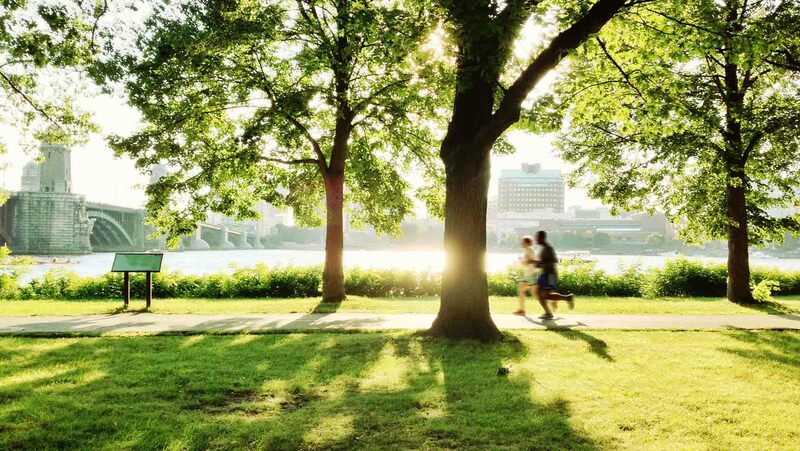 Green fitness, or getting active in natural environments, is an invigorating way to get your blood pumping. Whether it’s a hike, a walk along the beach, an outdoor yoga class or a bike ride, exercising outdoors combines the benefits of physical activity with the refreshing goodness of fresh air, natural light and connection with nature. Many of us know the natural mood boost that exercise can bring. This feeling of wellbeing is the effect of endorphins, the feel-good chemicals that are produced in the body (specifically, in the pituitary gland and hypothalamus, in your brain) during exercise. Sports scientist Luke Ashcroft says taking your workout outdoors can make exercise more enjoyable, giving you that extra boost of motivation. “There has been quite a bit of research in this area and a number of psychological, physiological and economic benefits to exercising outdoors have been identified,” he says. Being active in beautiful surroundings can also feel more interesting than working out on a treadmill, which may encourage you to make it more of a habit. “Research in older adults finds that they are more likely to do more physical activity outdoors than indoors, because the environment is more stimulating and leads to more enjoyment,” Ashcroft says. Here, Ashcroft shares a few more benefits of outdoor exercise – and some tips for getting the most out of it. When you use machines at the gym you isolate the working muscles and run the risk of switching off your postural muscles. So while you’re pumping your pecs, the scaffolding that holds your body upright – the muscles in your legs, trunk and upper back – are neglected. Even running outdoors has many benefits compared to running indoors. Wind provides extra resistance, obstacles like hills and stairs can increase intensity and uneven surfaces can help develop balance and coordination. Sprinting in a curve (think of the first and third hundreds on a 400 m track), which is impossible on a treadmill, has great benefits for core strength. Simple bodyweight exercises like squats, push ups and sit ups can provide an excellent workout for most people. To increase intensity and difficulty, propulsion can be added (jumping squats and clapping push ups). Further complexity and intensity can be added with exercises like burpees, mountain climbers and bear crawls. By incorporating features in the outdoor environment such as benches, fences, walls and trees, an intense and challenging exercise routines can be developed for virtually everyone. The variety and stimulation that comes from exercising in different locations with different light levels (sunny versus cloudy) and different temperatures can help to keep exercise fun and interesting. Anywhere you have room to move can present opportunities for exercise. The beach, a grandstand, a staircase or a sports ground can all be used to add extra intensity or variety to an outdoor exercise program, but my favourite would have to be the playground. Time and convenience are also cited as barriers to exercise. The beauty of the outdoors is it is usually only a few steps away! Rather than setting aside extra time to travel to and from the gym you can get started on an exercise program in a matter of seconds. Luke Ashcroft is a sports scientist and outdoor fitness specialist with over 20 years of experience in the industry.